This episode is with hymn text writer Sister Delores Dufner. Sister Delores is a member of St. Benedict’s Monastery in St. Joseph, Minnesota, a Benedictine women’s community of about 200 members. She holds Master’s Degrees in Liturgical Music and Liturgical Studies. She is currently a member of The Hymn Society in the United States and Canada, the National Pastoral Musicians (NPM), the American Society of Composers, Authors, and Publishers (ASCAP), and the Monastic Worship Forum. Sister Delores was a school music teacher, private piano and organ instructor, and parish organist/choir director for twelve years. She served as liturgy coordinator for her religious community for six years, Director of the St. Cloud Diocesan Office of Worship for fifteen years, and a liturgical music consultant in the Diocese of Ballarat, Australia, for fifteen months. Since then, she has been writing liturgical, scripture-based hymn and song texts which are found in many Christian hymnals. Her hymns have been published in the United States, Canada, Great Britain, Australia, and China. 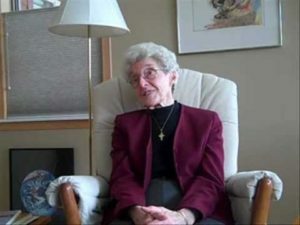 Sister Delores was named a Fellow of The Hymn Society in the United States and Canada in 2013. In 2014 she received a Lifetime Achievement Award from NPM, the National Association of Pastoral Musicians. In 2017 she received the Christus Rex award from Valparaiso University’s Institute of Liturgical Studies for her lifelong commitment to liturgical renewal. An interview with hymn writer Delores Dufner, OSB, focusing on the craft and art of writing hymn texts. Vatican II really motivated me and gave me materials with which to work. That return to the sources was essentially a turning point in my faith life, especially the emphasis on Jesus’ ministry and his life…Seeing and paying attention to what Jesus taught gave me a whole new insight into what I wanted to teach and live. I need to create space in order to write… When I actually sit down to write, I lock my office door, put the phone on automatic, and isolate myself until I have a first draft. Pope John the XXIII was a huge influence. He gave a new idea of what the church could be and should be. There was a real freedom in that and a vocational call. It has to be good news – not just true, but it has to be good news and it has to sound good! My big goal right now is to try to connect science and faith, because so many of the prayers of the liturgy come from an antiquated view of the universe…I want to do more with writing about the cosmos. Oh, Sister Delores, what honors you have received, but great service you have provided with your beautiful hymns. I think of you often, but so much has been happening with my children’s health and now my husband’s health that I have saved my energy and time for them. Love you dearly and thank you for all that you have accomplished for Christianity and for all religions.